The state government wants more private developers to come on board to build affordable housing units. Penang Housing, Town and Country Planning Committee chairman Jagdeep Singh Deo said that with 22,500 affordable units to be built over the next 10 years, private developers should grab the opportunity to be part of the ventures. “While the majority of the projects are undertaken by Penang Development Corporation, private-public partnerships can be further enhanced if firms join in,” said Jagdeep. He was speaking during the groundbreaking ceremony of Asia Green Group’s The Clovers luxury condominiums and Merbah Court low-cost units in Sungai Ara. The Penang Development Corporation, he said, has started building 540 units in Batu Kawan under the affordable housing project and more would be built over the next few years. 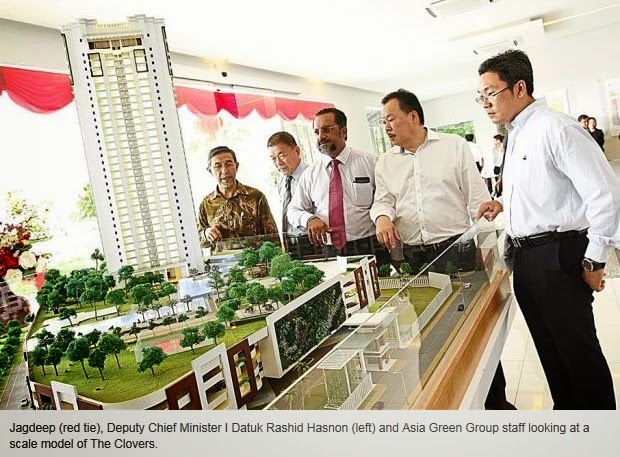 Asia Green director Tan Li Mei said The Clovers would be one of the company’s maiden lifestyle projects. It will have one of the biggest podium landscaped gardens in Penang which includes a mini forest park and water features. She said the pricing of RM450 per sq ft would be a boon to buyers as there would definitely be a greater price appreciation of their units when the goods and services tax is implemented next year. The Clovers consists of 42-storey blocks in the shape of a clover with units ranging from 776sq ft to 1,598sq feet. “Those who are seeking more comfort and luxury can buy the one of the 24 penthouse units. They range from 1,875 to 2,907sq ft,” said Tan. Each unit will have two private lifts offering direct and convenient access to individual flats. Exercise amenities will include three swimming pools (leisure, Olympic and children), a floating gym, forest tracks and a basketball court. Residents can relax at a large rooftop garden while children will have a play area. Visitors can hold parties at a barbeque area and there will be dance, game and entertainment rooms as well. Tan said the CCTV security system and car-only access at The Clovers would give residents a sense of safety and security. On Merbah Court, Tan said the project comprising 349 low-cost housing units was part of the company’s commitment to the state government’s affordable housing project.